The news has not yet been officially announced by Bosch US, but I see not point in waiting. The new PB360S is replacing the much older PB10-CD radio, and looks like more then just a face lift; a complete redesign is more likely. Sure it still has the same boxy look, and now an even cooler looking roll cage, but that is about it. Why update the radio at all? The answer is simple, the old radio did not work with the newer Bosch Lithion batteries. This is good news for people with all new Bosch cordless tools, but bad for people with both new and old Bosch cordless tools. Why? Because the new radio will only accept the newer Lithion 14.4 and 18 volt batteries, thus leaving your old batteries homeless. The Bosch radio also allows you to charge your cordless batteries when you are running the radio from AC power. Bosch also updated the electronics of the radio, and now allows you to play music from USB, as well as SD/MMC memory cards. MP3 and satellite radio fans will be happy to know that Bosch has included an AUX input and a Media Bay. Lets not forget about AM/FM Radio; and though it is not mentioned, it looks like a CD player is also included. Bosch also boasts 360 degree sound, because sharing your music is a wonderful thing. It doesn't end there, the “PB” in PB360 stands for power box. 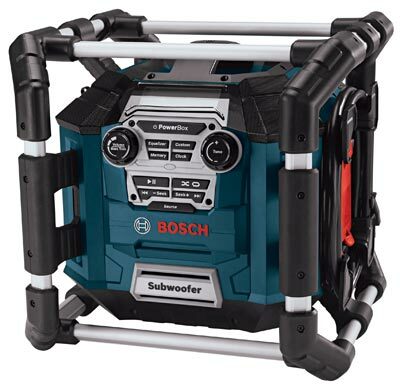 The radio also includes four 120 volt AC GFCI protected outlets, and even a 12 volt DC cigarette outlet for charging your phone, mp3 player, etc. Update: The Bosch Rep. saw this post and was kind enough to send over some more information and photos. It turns out a CD player is not included. Yeah, we all knew this would happen eventually. This is why they have added so many options for playing digital music. There are two AUX ports, one inside the Media Bay, and one outside. The Media Bay is also weather sealed, to help keep your precious iPod safe. The USB slot also does more then just play your music files, it can also be used to power your mp3 player, or any other USB device. It also turns out that Bosch has produced two models. The PB360S has 2x more sound power output then the previous model, while the PB360D has 4x the sound power output. Model PB360D also features a built in universal Sirius satellite radio docking port for connecting select Sirius satellite radios. Availability is set for June 2010.